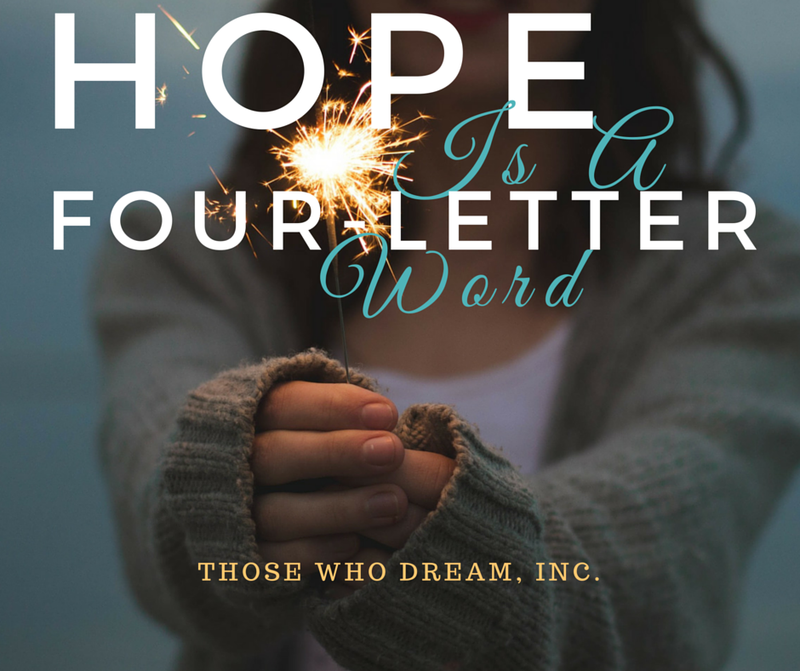 Hope Is A Four-Letter Word - Those Who Dream, Inc.
Our words have power. For so long I dismissed that truth mainly because I was so put off by televangelists who hijacked it with “name-it-claim-it” theologies. I have spent my life chasing Hope. That journey took me through over a dozen nations — I looked for it in so many places. But Hope wasn’t someTHING to be found. No, Hope was someONE. Hope was a Person. The truth is that our words are not magic. They are powerful. That means that our words do not become spells to conjure what we wish to happen. Sometimes our words are most powerful in tragedy. I’m living proof of that fact. I found Hope in the eyes of children throughout the world as a young girl. This man — Jesus — the King who left glory for the dirt, He was there. In the chaos, He had turned holy. In the suffering that I witnessed, but didn’t experience first-hand. Until I did. On a rainy day in August, we buried our little Boy, Beau. I thought Hope had left us. Then, lightening struck twice — and a year later, our most paralyzing fears came true, and we buried our baby Montgomery. When I was a traveling vagabond of a missionary, a blind man was healed in front of my eyes in the middle of nowhere in the african bush. I found Hope there. People cheered. I thought I had found the answer I had been searching for when I found Jesus in the dirt of the third-world. But I only knew a half-truth. Most of us spend our lives living out our faith as tamed house cats rather than powerful lions. Our faith has a tendency to become domesticated and supernatural living becomes a philosophy rather than a lifestyle. It’s so very easy to fall prey to believing following Jesus means adopting wishful thinking. Isn’t that what we’ve done with HOPE? We hope that our lives will matter. We hope that someday our kids will grow up to be happy and walking in the fullness of who they have been made to be. We hope our favorite team wins the game. In the same breath, we hope that our family member becomes a cancer survivor. We hope tomorrow is better than today. We hope. But do we know the Person of Hope? So many times we use the word hope when all we are really referring to is wishful thinking. We forget the power of who Hope is. We forget the power that blew open a grave and conquered death so that we could know life that is abundant, never-ending, and free. We forget that that same power lives inside of us. We use the word hope as a way to express our uncertainty. And when our vision of hope is destroyed through suffering, we feel lost and abandoned. When we use hope to describe our own feelings of fear, we unknowingly un-follow the person of Hope. Hope is a four-letter word. There were many days in the aftermath of our tragedies where I definitely used four-letter words. But Hope wasn’t one of them. I hated the loss of our dreams. That’s when I learned the rest of the half-truth I found with the poor in the third world. Hope is just as powerful in the times of tragedy, death and loss as it is in the times of miracles and greatness. In fact, Hope thrives and is most powerful in our ashes. The power of Hope — God with us — doesn’t ignore our pain. He is not a God who hides behind the suffering of the world — He is Good, and is not double-minded. This four-letter word of Hope speaks blessings into our lives. It’s not a magical formula for everything to work out right. It’s the same expectation of God showing up in the same way that He did on the day His Son died. Heaven, too lost a Son. Where was God when He himself needed a miracle? The story of Jesus’ death and resurrected is so revealing on answering that gut-wrenching question of the hurting of where is God in our suffering? Heaven’s Son was hanging on a tree and all of Hell rested on His shoulders. He cried out for His Father — but the world thought that God answered, “No”. It seemed as if God did not show up. There was no miracle. No gold dust or smoke machine. There was no majesty in the death of this royal. Just great darkness blanketed him. I remember the day I had to tell the world God had not answered our prayers, and we would not be bringing home our son from the hospital. I still remember the shame that I wore that day. The same cheers that overwhelmed us when the miracles happened, grew strangely silent. Had He said “No” to the cries of our hearts? But just like Heaven’s story, ours does not end there. He always redeems. The resurrected King, resurrects us. By His spirit we rise too! We rise from the ashes of our defeat, just like He did. That’s the power of Hope. Nothing touched by Him stays dead forever. I think it’s time to use these four-letter words again. Not because we wish for a happy-ever-after. But because we know who He is — and that He doesn’t change. I struggled for a long time after our boys died not because I lost sight of who God is — that He was Good. Not because I believed God had orchestrated my pain as a “test” and not because I believed God just closed His eyes to my suffering. It was simply because I missed the rest of the story. I thought it was over. I thought God had answered. I thought our story had ended. I thought He had left. I thought that I would always have to live with the deep question of why God had “chosen” to heal one of my children, but not the other. I thought it was a Yes – No answer. He hadn’t said “no” to my gut-wrenching cries as I gripped my babies in my arms and begged Him to breath life to them again. Just like He hadn’t said “No” as all Heaven watched the Son cry-out His last breath and Mary held Him in her arms crying out my same cry — for a son to live once more. God didn’t fail to show up. This was the precessional to the greatest miracle the world has or ever will know. God showed up when He robbed the grave three days later. You see, God ALWAYS shows up. He didn’t leave His only Son anymore than He will ever leave you. For a long time, because of the networks our family is in, I begged for isolation. When people shared miracles of how “God had come through” for their family, I ached inside. Each time I saw a story of God healing a baby, my faith felt beaten. Bad theology — even well-meaning encouragement from friends and ministry friends made me believe that sometimes miracles happen and sometimes they don’t. But when God showed up in our ashes, I saw His truth. He was here the entire time. God-with-us means God-never-leaves-us. Our God has robbed the grave. If you’ve struggled with the thinking that God didn’t show up when you needed Him most. If the confusion of why haunts you and your faith feels broken, I want to remind you of who He is — and that your story isn’t over. The resurrected King is resurrecting us. We are rising from our ashes. And we are watching for Him to trump our suffering with His power. And He is. Our family has an announcement coming soon. Stay tuned.